There are two ways to Create WordPress Theme from Photoshop psd files. The first way to Create WordPress Theme from Photoshop psd file is to actually find a suitable theme, preferably a WordPress premium Platform and follow instructions written on their website. The second way to Create WordPress Theme from Photoshop psd file directly by using a nice Photoshop Plugin : Divine. We have promised in this article Create’s title to Create WordPress Theme from Photoshop psd file in 5 Easy Steps. We will take 3 steps for the First method to Create WordPress Theme from Photoshop psd file and 5 steps to Create WordPress Theme from Photoshop psd file using Divine. Copy all the images from the main Platform or Child Theme you want to modify from Theme’s images folder and open one by one in Photoshop. We are assuming that, in order to create WordPress Theme from Photoshop psd file, you already have created a psd itself. Now, your first work is to open the default images in Photoshop and create new layers over them > Duplicate from that Photoshop file > resize and position properly to fit the dimensions. Delete the layer (or make invisible) of old image of the WordPress theme you targeted to modify and save and replace with the originals. If properly done, it is the easiest method to create Create WordPress Theme. Now the CSS part. Obviously you might want to change the width of your WordPress Theme or add/remove more features. You might argue, is this a method to Create WordPress Theme from Photoshop psd file! Yes, this method is widely used by some Premium Theme Designers to Create WordPress Theme, specially the Child Themes. Download / Purchase Divine Plugin from the link above : its the main step to create from create WordPress Theme from psd file. Divine is an exe file, just double click and follow the Wizard to install it. Either modify the bundled psd files or Create your own. Divine itself has lot of Tutorials to Create WordPress Theme from psd file. Follow the Wizard and get your result; i.e. WordPress theme. Test on a offline or online installation, it might have some problem, fix them. Requires some knowledge about CSS, WordPress structure to Create WordPress Theme with this method. This Article Has Been Shared 3036 Times! 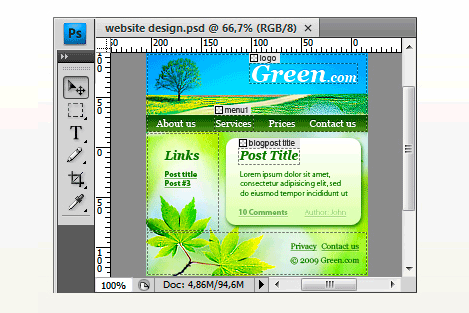 Cite this article as: Abhishek Ghosh, "Create WordPress Theme from Photoshop psd file : 5 Easy Steps," in The Customize Windows, July 29, 2011, April 18, 2019, https://thecustomizewindows.com/2011/07/create-wordpress-theme-from-photoshop-psd-file-5-easy-steps/.